Google has just announced that Andy Rubin will be moving on to a new role at the company, and that Sundar Pichai will now lead the Android division, in an official blog post written by CEO Larry Page. Pichai will take on leading Android in addition to his existing duties spearheading efforts with Chrome and Apps, which indicates a move to unify all these platforms. In his blog post, Page said that Rubin “has decided” to move on to other projects (still within the company). There’s no additional detail on what Rubin’s new focus may be, but Page calls for “more moonshots,” so it’s possible he’s moving into a more experimental role. As for Pichai, he adds the new duties to his role as VP of Chrome, which is an interesting move in light of recent developments tying Chrome and Chrome OS closer to Google’s mobile platform. Changes to the Chromium developer builds which later led to stable versions of Chrome have included suggestions that Google Now will make its way to the desktop, for instance. Page wasn’t above clichés when describing how Pichai would be good for Android: he wrote that the new Android chief would be “doubling down on Android” as the company “work[s] to push the ecosystem forward.” Google Now even got a specific mention by name in the closing paragraph of the announcement, which speaks generally about Android and mobile adoption, and also highlights the Nexus program and Google’s OEM partners. 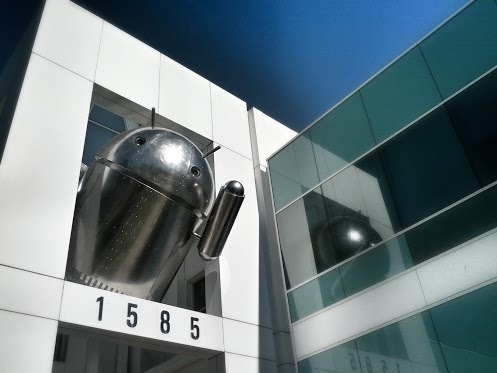 There has been lots of talk about how a potential merger or marriage of Chrome OS and Android in particular might make sense for Google, and a Google employee recently teased the image below taken at the Google campus. Obviously you can’t infer anything from a chrome robot statue, but a high-profile role change like this one adds actual significant weight to existing speculation.